All the world's a stage... and your kids can be the players! Expand your kids' imaginations as they discover new skills, hidden talents and the thrill of performance with workshops in movement, puppetry and improvisation (to name a few). 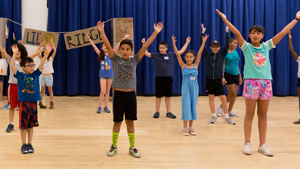 Your kids will gain valuable skills of teamwork and collaboration by creating an exciting piece of theater together with other participants. Led by New Victory Teaching Artists (professional actors, puppeteers and dancers), the week includes a show at The New Victory and culminates in a performance for friends and family. To kick off the week, families will be invited to participate in a Family Workshop on Sunday, July 14. Kids Week is 5 full days (9am - 4pm) and held in the New 42nd Street Studios. Lunch and snacks not provided. *Initial registration online is a $100/registration non-refundable deposit. Someone will contact you shortly thereafter to collect additional information and coordinate payment of the balance. If you have any questions or would like to speak to someone about our need-based scholarships, please call us at 646.223.3090. Member pricing is available to households with active Member status at time of purchase. **Multi-registration discount does not apply to Member price. Choose a date and time Mon 7/15/19 9:00AM - Kids Week - New 42nd Street Studios - Sold Out!